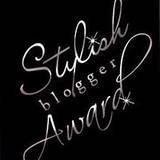 I was very fortunate to receive the "Stylish Blogger Award" from Patrice Herrera. Her blog, "My Little Patch of Dirt" is amazing and I encourage you to check it out. Besides being an amazing stamper, Patrice is a sweet, wonderful, encouraging friend! I was very touched to receive this honor from Patrice. Another great thing about this award is that you get to pass it on. I have found six ladies who are also amazing stampers and crafters who deserve this award. Please be sure to check out their blogs so you can see their amazing artwork. Shari Dudek "Shari's Stamp Pad"
Kim Innis "Kim's Kreative Inkings"
Kelly Mayou "The Weekend Stamper"
Jackie Watson "Creative Designs by Jackie"